Baby Boomer Davy's Locker: A History Making Day in Our Lives! A History Making Day in Our Lives! 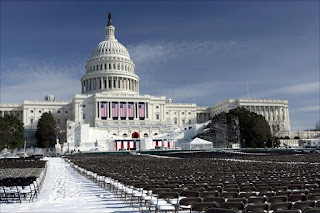 This Inaugural Day, January 20, 2009, will be an event that is undeniably something that will unprecedented and a story to tell our grand children, for sure. As the day gets closer, you can feel the excitement as the media realizes that the world is finally understanding the significance of this day’s history for our country and the entire world. This day shows the world that the United States of America truly can be, what it’s best ideals have always been! All democratic societies will have their good times and bad times. No country or government will ever be perfect. It’s not about being perfect. It’s about how a country handles it’s bad times, as well as it’s good times. We have obviously hit an extreme low point in our country’s history, but that has occurred before. We have all been living in a time of perhaps not realizing what makes our country so great. Sure, we know and are deeply saddened by some of the ways the United States seems to have lost some of that “land of milk and honey” idolization, but there still is no doubt that people of the world still would rather live in the U.S. than any other place in the world. So, although it may be a bit tarnished over the last few decades, it is how we handle and move forward that defines us. It is how the country pulls together and climbs out of it’s hard times and that we DO have the right and ability to recognize our faults and FIX them that makes others around the world want to live here or emulate our principles, or at least try to. As the hours move forward to January 20th, and we see the excitement spread throughout the world, to not only see Barack Obama become the first African-American President of the United States, but to see the light of HOPE at the end of the tunnel, that even if for a few fleeting moments, we can stop and realize what human beings CAN BE and DO, if they want to! The Baby Boomer generation has played a large part in all the occurrences of our country over their lifetimes, yes both good and bad, but we have played a huge part in the “what makes this country great” as we rise up when the country is down, as we rise up when others are suffering and need help, and as we come to the realization that we are only here for a short time and we should use that time to leave the world a better place than we were given...for the future generations. I will be among those attending the Inauguration and I am so excited! I never thought I would live to see an African-American President in my lifetime. Simply awesome and amazing! That's FANTASTIC Beverly!!! I can only imagine how you must feel, as I am so excited myself. Enjoy and take pictures, if you're allowed. I will be watching ALL WEEKEND! I was just making sure someone was paying attention....and you did... :-) Thanks for the correction.